Dec 06, 2012 by James C.
Nice - A CLEAN food truck with unbelievably good food and a very friendly wait staff. I've tried out The Roving Italian a few times thus far. The three items I ordered were absolutely delicious. Porchetta - a very nice combination of melt in your mouth seasoned pork, with just enough crispiness to provide a nice texture. The meatballs are not your garden variety - baked in the oven variety that most restaurants produce. These are the real deal - the kind made by your grandmother; if you were lucky. The sauce was delicious - not overpowered by garlic or other spices; a nice blend of flavors and seems like there's pork in there, as well. Overall - a nice tomato flavor. The sliders had buffalo mozzarella and a piece of basil. A nice touch. A gentleman next to me bit into his slider before I bit into mine: "Whoa, this is good!" The Mac and Cheese is killer - good. As simple as Mac and Cheese appears, I find I'm quite hot and cold on textures and flavors that I find at most places. Most aren't bad, but many aren't worth a second try. The Roving Italian easily has the best Mac and Cheese that I've every come across. Next time I'll try the soups... This roving kitchen is a keeper! 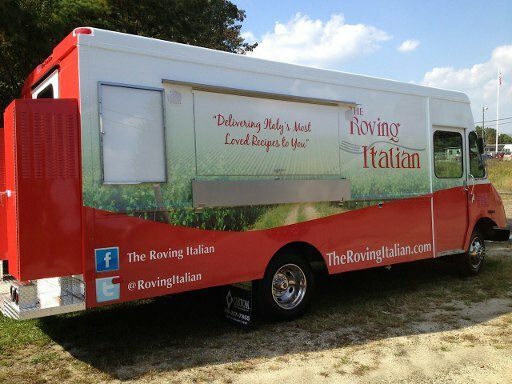 The Roving Italian food truck is coming to Loudoun County, Viriginia in the fall of 2012. They will serve classic Italian street food, with a modern twist. 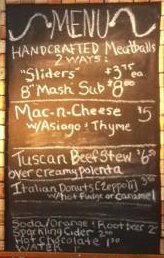 Look for meatballs daily, with rotating items, using local Loudoun County ingredients where possible. Bread will be supplied by the local DC Lyon Bakery.